by Grown-up Travel Guide Contributor in Europe, Home, Italy, Places. In 1787 Johann Wolfgang Goethe visited Taormina and described the town as “a piece of heaven on earth” when he wrote “Italian Journey”. Then just as now, everyone who spends time in Taormina is fascinated by its charm and stunning landscape, celebrating it as a unique pearl of the Mediterranean. It is a sought after destination not only for lovers of the sea but also for enthusiasts of history, culture, art – and quite simply, for those who love liveliness. 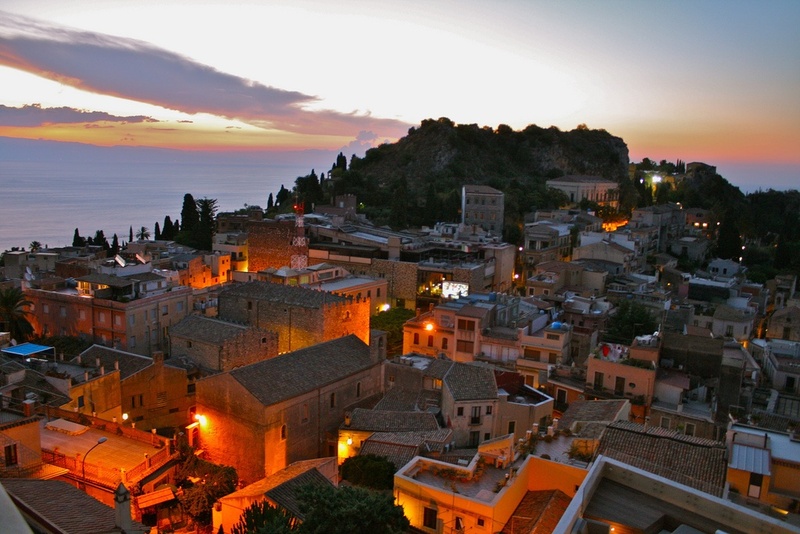 The international ‘jet set’ continue to choose Taormina as their favourite destination for a summer holiday in Sicily, adding their names to those from the past. Elizabeth Taylor and Greta Garbo loved Taormina and helped to add glamour to the city. With Taormina looking down from the hills, Naxos Bay is one of the most beautiful places not only in Sicily, but in the entire Mediterranean area. The seaside resort of Giardini Naxos is heaven for beach lovers and the town both demonstrates and preserves the Greek history of the island. This two-day itinerary focuses on these centres, starting from Taormina and ending in Giardini Naxos. It should be noted that these are two of the most expensive destinations in Sicily, but it is possible to get some good deals booking vacation rentals directly with the owners on SicilyHolidayFinder.com. This tour allows visitors to experience all aspects of the towns, from the historic to the modern, from the local cuisine to the beaches. 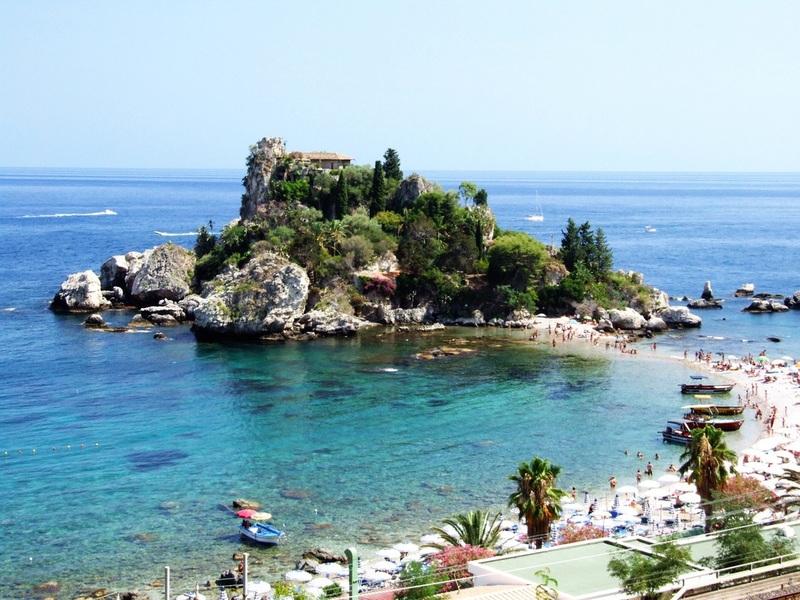 It’s perhaps lazy to say that the best season to visit Taormina is summer, as it looks wonderful all year round. But it is in summer that you can bask in the sun on the beaches of Spisone and Mazzarò, take a dive in the crystal clear sea waters and taste one of the best local specialities: the granita with brioche! This is a semi-frozen dessert, a kind of slush. You can choose from many flavours – the most traditional is lemon but try almond, strawberry, pistacchio and others. In Taormina you can take a walk and admire its Arab gardens, its unique urban layout and a rich melting pot of art of different styles – evidence of the diversity of its population through the centuries. Don’t miss the Roman-Greek theatre, from which you can enjoy a breathtaking view of Mount Etna. Passing along the main street, you can rest up in one of the many delightful cafes before shopping. Many international brands are represented with an emphasis on fashion – it’s a good place to buy clothes, bags, shoes and so on. It was the first Greek colony in Sicily, but today Giardini Naxos lives mainly from beach tourism. In fact, the beaches and lidos are crowded both during the day when people relax on deck chairs and sunbathe. During the night the lidos are transformed into beach discos with entertainment especially for young people. The big must-see here is the Archaeological Park and Museum, with the altar dedicated to the god Apollo. ← Like Grown-up Travel Guide? Start your own travel blog!